The residents still complain, and the housing authority often still ignores the complaints, but still, Santa visited the children, and the residents are getting new kitchens, bathrooms, windows, and siding. Once again, the housing authority, police department, fire department, recreation department, and generous caring members of the community have managed to put together a Christmas/holiday party for the children and residents of Pariah Street. Each of the children received several toys, games, and new clothing, while adults received gift certificates for clothing and food. Once again, the intent in part was to bring out residents who would otherwise argue and fight with one another, and give them an opportunity to see one another in a different setting. The answer is yes, but change takes time, and progress is a slow uphill climb. Getting the residents and staff to understand that concept is a difficult pill for them to swallow. People get frustrated, and the bullying—now called miscommunication—continues, although now, bullying is more often done softly with a velvet glove and not an iron fist. The residents are calling the housing authority more often to complain about other residents rather than taking matters into their own hands, and the staff are actually seeming to listen. The housing authority is sending out letters to residents who are violating the terms of the lease agreement, and the director is spending more time on site talking to those who not only call, but also to those who are committing the violations. There are fewer police reports and ambulance runs on the street now, but it is hard to know if things are improving, or if it is simply because the winter months are upon us. In the spring, the housing authority will betin to upgrade and improve the dwellings. We hope that if the residents have newer, cleaner surroundings to live in, that they will stop bullying one another because they feel better about themselves. We hope that management will be able to take a more direct and active role in tenant disputes because they will have more time to devote to improving their relationship with the residents. We hope that when workshops for bullying education are presented in the spring for the housing authority employees and residents, that they will all achieve a better understanding of all sides of the issues, and begin to appreciate how discussion to reach an agreement can be better than arguing and antagonizing. I am no longer living on Pariah Street, but I know as I look back that I was the force behind sowing the seeds of cooperation, and slowing down the traffic of confrontation. My question to myself now is, "who will pick up the tools and keep the garden growing?" Looking back over the five years that I lived on Pariah Street, I am reminded that while I lived there— although things were truly unbearable at times—I and my family were still counted among the lucky ones. We still had a roof over our heads, food to eat, heat in the winter, and a few neighbors who we will always have as friends. 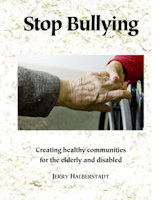 Bullying, while extreme on Pariah Street, will always be around us, and occasionally will still enter and affect our lives. It is what we do with it, how we manage it, how we teach our children to handle it, and the outcomes that will to some extent dictate and shape our lives going forward that will matter. There is one thing however, that teaches us about bullying and fear, and that is the direct impacts it has on the lives of our children. Our home is now much larger, it is a single family house in a brand new development of one hundred homes. Our children used to ask us to come up to bed with them every night. They were afraid to go to sleep, because either the neighbors next door were screaming and there were drunks on the street. It all frightened them, and if my wife and or I were not upstairs with them when they went to bed, then they needed to sleep in the same room to feel safe, they were protectors of one another. Now, since we have moved, and all around us is new, there has not been one single night that the children have felt afraid. Not once have they demanded that someone be upstairs while they fall asleep, and not once have they insisted on sleeping in the same room, not for any reason. The relief we hear in their voices, the relaxed but happy conversation, and most importantly, the smiles on their young but very impressionable faces tell not just their past story, but their whole story. Bullying hurts all of us, but when our children are surrounded by it, and it confronts them every day, it can have everlasting effects, and it all too often at too young an age, strips them of their purity and of their innocence. It is my hope, my belief, that with love and time to heal, with new friends, and people and neighbors who care, that our children will recapture some of their innocence and learn that fear can be overcome.